GERMAN electronics company Rohde & Schwarz opened its first global hub outside Germany here yesterday, named "Das Spektrum" ("The Spectrum"). The $58 million facility at Changi Business Park houses two entities. The first, Rohde & Schwarz Asia, functions as a global hub for research and development (R&D), supply chain management and global sourcing. The second, Regional Headquarters Asia, consolidates its sales operations for the Asia-Pacific, the Middle East and Africa. At Rohde & Schwarz Asia, the company will grow its Singapore pipeline products, said Lim Boon Huat, Rohde & Schwarz Asia's managing director. New products will be in core areas of testing and measurement, radio monitoring and broadcasting, he said. 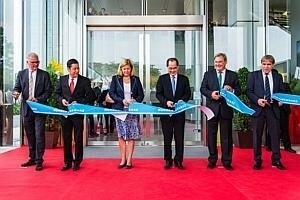 Rohde & Schwarz Asia is essentially a "centre of innovation", Mr Lim added. Local R&D activities started in 2010. Production volume here now stands between 2,000 and 3,000 instruments per year. "Production follows R&D and the idea is to produce instruments developed by the Singapore operations here," said Rohde & Schwarz's president and chief executive officer, Manfred Fleischmann. Mr Lim expects a doubling over the next three years of new products launched and volume. He aims for the product generation business under Singapore to reach 50 million euros (S$87 million) by then. The Singapore hub will have full product ownership and "profit made is parked here", said Mr Lim. R&D expenses usually amount to 15 per cent of the group's annual turnover, about 300 million euros last year. Mr Lim said about 25 people per year over the next five years will be hired for R&D. The company will mainly source locals from the electrical and electronic engineering profession. For talent sourcing, Rohde & Schwarz also signed an agreement yesterday along with three other German tech companies - Festo, SICK and Pepperl+ Fuchs - to offer internships and study opportunities to students from Singapore Polytechnic and Nanyang Polytechnic. The "Poly-goes-UAS" programme initiated by the Economic Development Board allows candidates to pursue an engineering degree from a University of Applied Science (UAS) in Germany and work in sponsor companies.